Check the roof for signs of pooling or standing water, particularly after a strong or lengthy rain event. This is a potentially dangerous condition as it could result in leaks or weaken the support beams beneath the roof’s surface. Ensure that rooftop vents or any equipment are well sealed to prevent leaks or wind damage when loose flashing is uplifted. Keep trees around the property trimmed away from the building. Trees can produce debris build-up which could end up clogging the gutters and drains, and branches can fall and damage the building during high wind or freezing events. Secure any loose objects on the roof, and periodically remove accumulating debris, such as leaves. Watch for the appearance of bubbles on your flat roof, which is caused by too much heat or moisture. If left unattended, you will be risking wind damage or leaks. 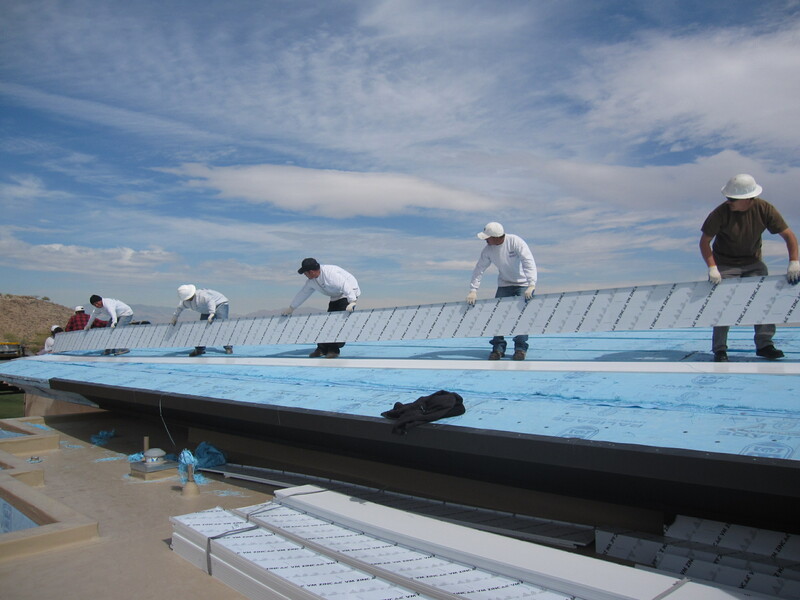 Because of the region’s extreme heat and winds, engineers recommend professional commercial roof inspections twice every year in Las Vegas. Ideally, the semi-annual roof inspections should be performed in the spring and fall after the end of the harsh weather seasons. A roofing professional will inspect the roof for any gaps in the flashing. He will check on the condition of your gutters and downspouts. He will be able to give you maintenance tips and recommendations so your staff can be proactive in spotting and preventing problems. Your roof inspector will also point out any damage to your roof and recommend a solution. It is advisable to have a professional inspect your roof after a severe hailstorm or wind even though it appears unscathed. Simple repairs such as sealing of cracks could be performed in the course of the inspection. Other complex repairs or complete commercial roof replacement need to be scheduled in advance. Don’t neglect damage found during an inspection. Repairing minor issues right away will prevent them from developing into much costlier and more extensive damage over time. Broken seals or loose flashing, for example, can lead to long term leaks, mold, or ripping of roof materials so that large sections need to be replaced. In addition to basic repairs, applying a reflective coating to your commercial roof helps withstand damages from the elements. White solar reflective coatings can help lower energy costs in the building as well as help protect the roof from UV damage. High-quality coatings are UV-resistant and can withstand Las Vegas’ extreme summer heat. A coating that has a significant amount of aluminum gives your roof a silver finish and also maximizes its reflective properties. 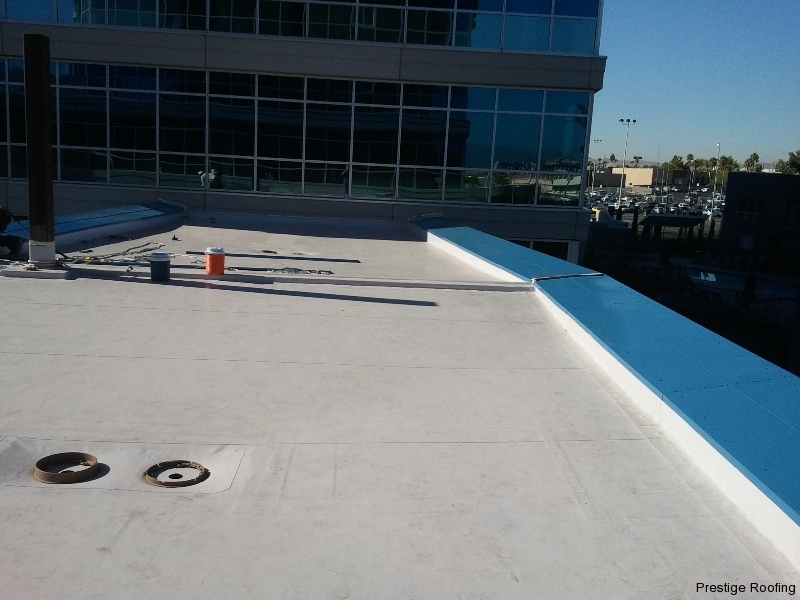 Or, just a fresh coat of coat of liquid bitumen will help renew the roof’s waterproofing and UV protection. While some of this work can be done by your maintenance crew, consult with your roofer for the best solution for your roof’s particular needs. It saves you money – with regular inspections and maintenance, your overall repair bill will be lower. You won’t be hit with surprise repairs that are worse because of years of neglect. Problems will be caught and fixed before they escalate. Protect your warranty or insurance claim – most roofing brands will void their products’ warranty if a failure is as a result of poor maintenance. Moreover, should you file a claim for a storm-damaged roof, the insurer might be able to avoid payment if you have not kept up with its maintenance. Check your roof warranty and your business insurance coverage to be sure you understand your obligations for keeping the roof in good condition. Lower risk factors – with regular care of your roof, any equipment you maintain on the roof is regularly checked, helping to make sure that malfunctions due to damage or debris are less likely. This also creates a safer working environment for your employees. Less energy waste – not maintaining your roof and equipment drains your energy leading to inflated utility bills, and maintaining a reflective coating helps lower cooling costs in summer. No surprise damages – major damages could disrupt your activities, destroy personal property in the building, like equipment, records and furniture, or even cause you to close down your business. Taking care of your commercial roof regularly warns you of any potential problems. While you may have been prudent in maintaining the roof of your commercial building, there are instances where you urgently need to call in a professional. If you notice excess granules on your gutters and downspouts, it could mean that your roof has reached the end of its life cycle. Granule build-up implies that the roof has lost its texture and sturdiness, and might fold in or tear should there be a huge storm. If you notice the roof is sagging, it’s time to engage a professional. Water stains on the ceiling could be as a result of an undetected leak. In such a case, a professional will be able to identify and remedy the situation. 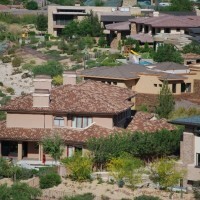 Knowing your roof’s age helps you discern when it’s due for replacement. 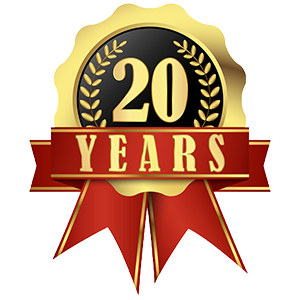 Most roofs are designed to last between 20 to 25 years. Keep an eye on its condition as it approaches this age, and prepare to replace it. 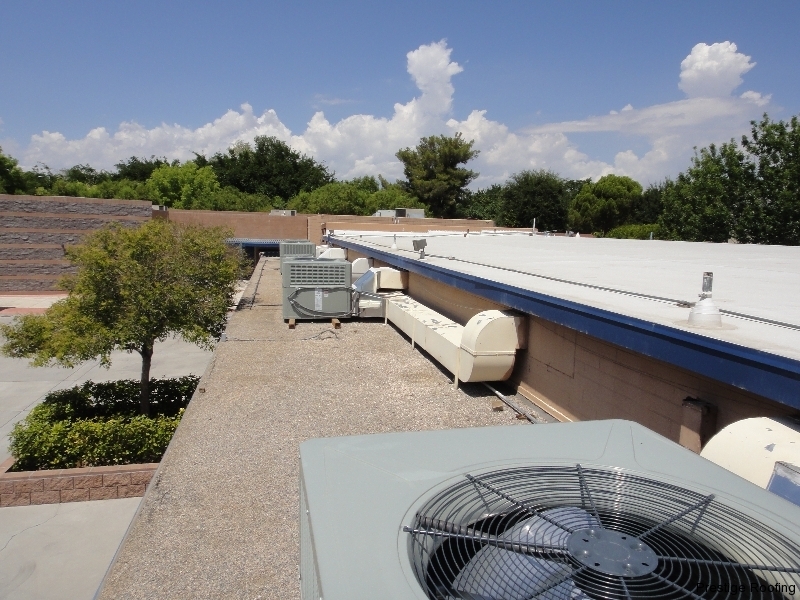 At Prestige Roofing, we will conduct a full assessment of your commercial, civic building, or residential roof in Las Vegas Valley, including a report on our findings. We can work with your team to come up with a preventive maintenance plan. When it’s time for a replacement roof, Prestige is an experienced commercial roofer who can help you make the right choices for a new roof for your building. Contact us today at 702-646-7536 for a free estimate.